Spanish explorers are given credit for bringing the first long-horned cattle to the New World. Columbus, in 1493, brought them to Santo Domingo. A few years later Cortes stocked Longhorn cattle on his holdings in Mexico, naming that grand estate Cuerno Vaca, "Horn Cow." In 1540, Coronado took a cumbersome number of sheep, goats, hogs, and at least 500 head of Spanish cattle as food for his expedition to find the Seven Cities of Cibola. 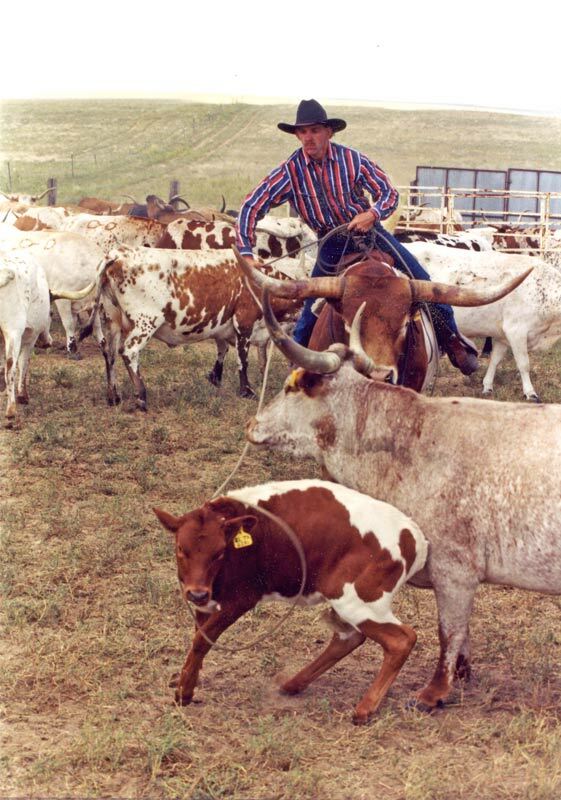 Some of those Longhorns were abandoned along the way, left to run wild and twenty-five years later, they numbered in the thousands, available to anyone able to catch them. Other breeds took the long sea voyage to North America but would not survive their new surroundings. Eventually, in Virginia during the early 1600's, British colonists managed to maintain a breed of English bovines that would later be known as Native American cattle. But it was to be Spanish animals from the Andalusian Mountains of southwestern Spain that would eventually influence the history of the North American continent and become the cornerstone of America's legendary cattle, the Texas Longhorn. By 1783, 1,400,000 hides were shipped to Europe from Buenos Aires alone. Some Mexican ranchers were known to be branding as many as 30,000 calves yearly. This New World breed of Spanish Cattle became known as Criollo, or "cattle of the country". During the next 300 years the Criollo, ancestors of the Texas Longhorn were bought, sold, stolen and fought over. Some were selectively bred, while at the same time thousands were surviving very well on their own. In the 1800's, Longhorn cattle were plentiful across the western face of America. Feeding the growing population of gold seekers caused the price of Longhorn beef to soar from $1.50 to as high as $30.00 per head in the region of San Francisco. 1,000 head of Longhorn cattle were taken to southern Alberta, Canada in 1876, which multiplied to nearly 40,000 head in the next 8 years. Longhorn cattle have made it through freezing weather, floods and droughts, Indian raids, the Civil War, and tough conditions through which no other cattle could have survived. Most ran free, requiring no one to care for them. Rugged, hearty, and unharmed by many of the diseases affecting other breeds, the Longhorn relied then as now on intuitive cunning, endurance, strength and their long horns to protect themselves and their young. 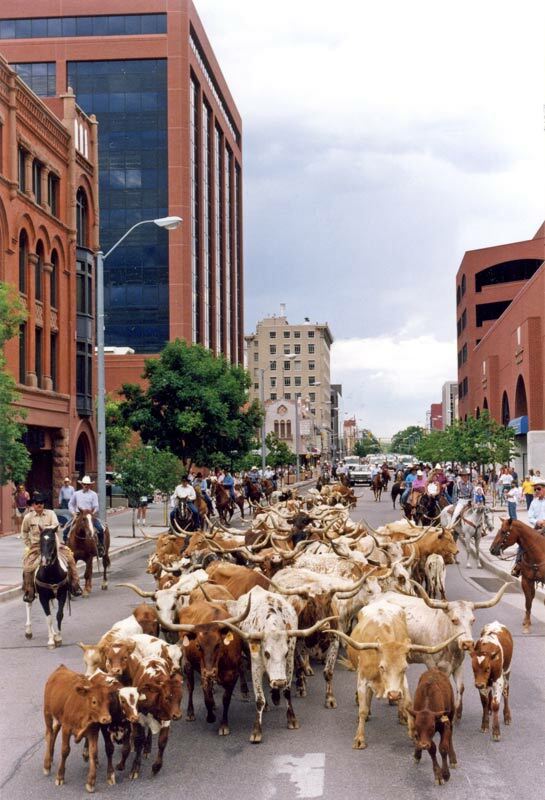 Whether raised by ranchers or rounded up from the wild, Longhorns were eventually taken north in phenomenal cattle drives. According to history and present day authorities, it was the Longhorn that was responsible for opening the Dodge City, Kansas cattle market. Buyers from New York to Wyoming arrived early just to watch the magnificent long horned cattle being driven into the stockyards. 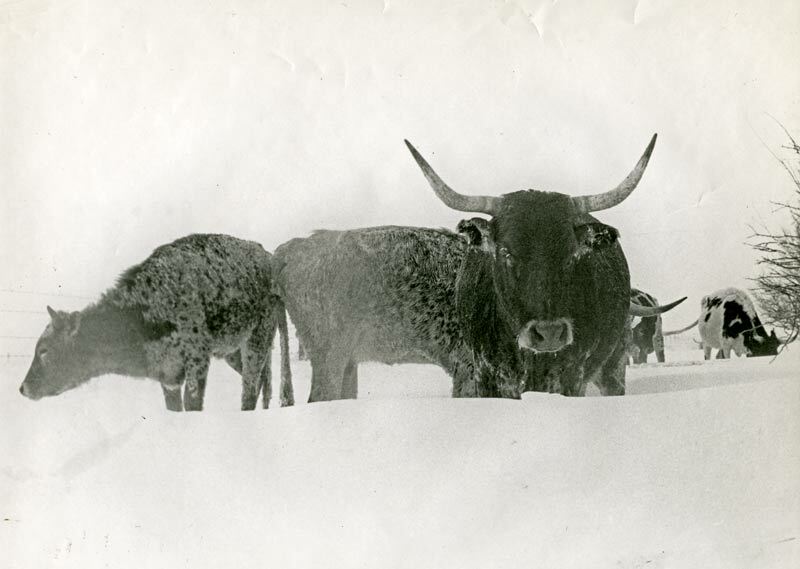 By the 1920s, Longhorn cattle had become a rare sight. Six ranching families preserved and bred pure Texas Longhorn stock. They were the Wright, Yates, Butler, Marks, Peeler, and Phillips families. Each for many years raised stock completely unrelated to the other herds. Their efforts planned or otherwise, were the vital factor that prevented the breed from extinction. In 1927, to insure their preservation, a government herd was established at the Wichita Mountains Wildlife Refuge in Cache, Oklahoma. All of today's Longhorn breeders are raising direct decedents of animals collected and protected by these seven entities. For over 500 years, Longhorn cattle made important contributions to the history of this continent: feeding explorers, pioneers, Indians, and Armies. As a beast of burden they pulled more conestogas westward than any breed. They created historic wealth, health and now a modern industry that is thriving again. Having survived the threat of extinction, Longhorn cattle are once more increasing in numbers, popularity and profitability. Known for their naturally lean meat, Longhorn beef is sought after for its healthy properties. Colorful hides and long-horned skulls have become popular and valuable decorative items. Riding steers and trophy animals attract attention because of their gentleness, colorful coats and enormous horns. In 2007 at the prestigious Texas Longhorn Legacy Sale, select cows with over 70 inches of horn tip to tip, grossed over $2,000,000 in 113 premium lots. When the gavel came down on the highest selling animal, the final bid was $82,000. In 2006, one cow sold for a record breaking $100,000. She held that honor only a few minutes before being outdone by a cow selling for $150,000. Somewhere in time, the name Texas Longhorn was used to describe these unique Spanish cattle and it became their official name. Across the Americas, Canada, Mexico, and parts of Europe, Texas Longhorn cattle are being bred and raised. 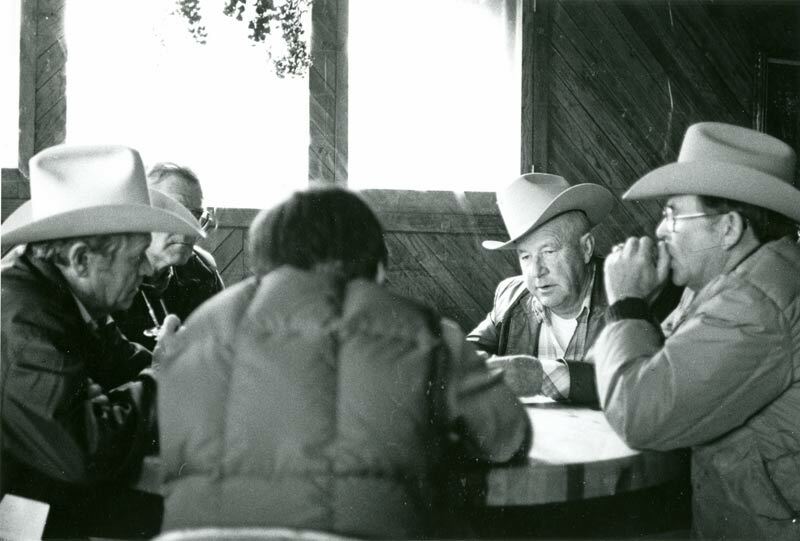 Ranchers are eager to maintain the heritage, lean beef quality and legacy of this truly incredible animal. Used by permission of Paige Evans, Kiowa, Colorado--thank you!